I don't really have any postal related stamps that I haven't already shown. Sub Post Offices fulfil an indispensable role in the Post Office counter network. 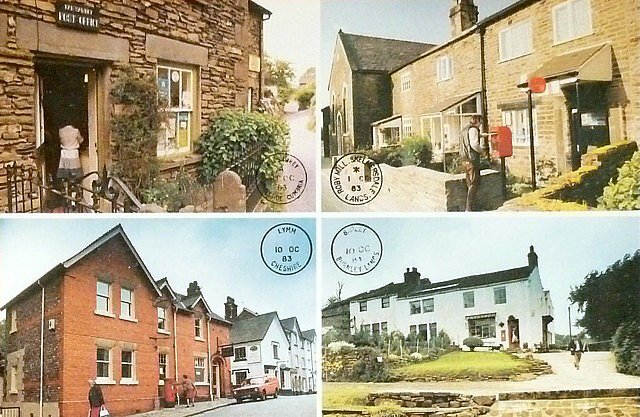 Four of the NWPBs sub post offices are shown on this card. Far Sawrey, AMBLESIDE, Cumbria; Roby Mill, SKELMERSDALE, Lancashire; LYMM, Cheshire; Barley, BURNLEY, Lancashire. Superimposed on the cards are the counter datestamp impression of each office. 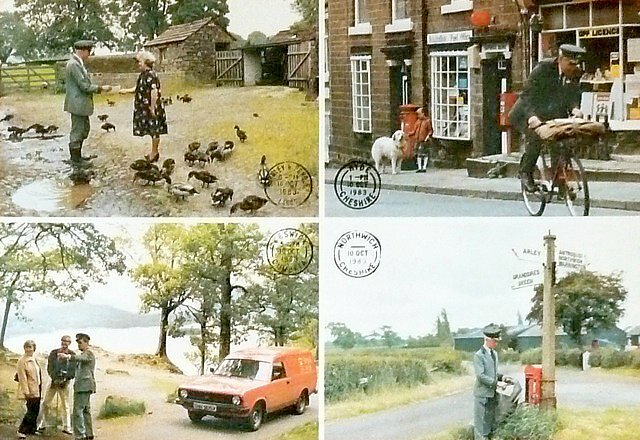 This card shows four of NWPBs Rural Postmen on their daily round at Pendle; Broadbottom, Hyde; Surprise View, Derwentwater; and Northwich. 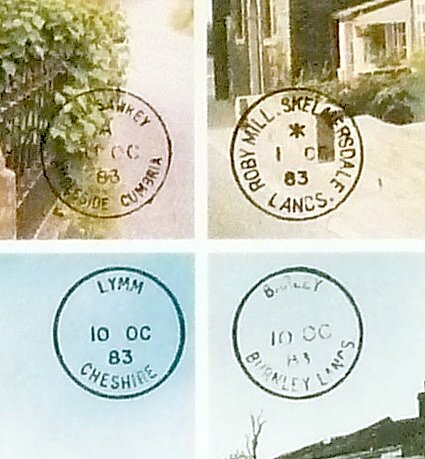 Superimposed on the cards are the datestamp cancellation of the offices from which the postmen work. Do these towns mean anything to some of you from England? And do you know what NWPB stands for? I love these old cards. It feels like I am getting a glimpse of a world that doesn't exist anymore. I think you definitely are - from what I understand, many of these substations are being closed to cut costs. NWPB = North West Post Boxes (from where they are located) 49 years after these cards a lot of sub- post offices have been closed. These cards will become an historic record. Of course... so obvious once you know! Apparently the Post Office has decided they are dispensable after all. Decisions made by people nowhere near small towns, I guess. Beatrix Potter lived at Sawrey, so you can imagine Peter Rabbit peeking round the corner - though her cottage isn't in the village. I obviously haven't been paying attention to the little details of Beatrix Potter's life. She may have used this post office to send out her stories? 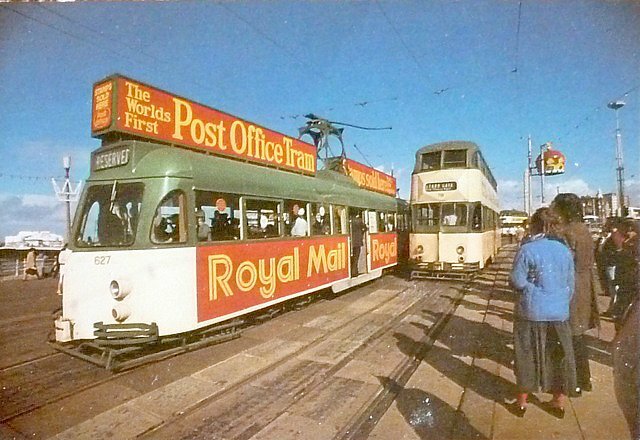 Wow, that post office tram is amazing. It was an interesting idea. I couldn't find out long it was actually in service. I lived in Cheshire for a time and my parents lived near Blackpool. When we we students in Liverpool one of our group lived in Skelmersdale. We used to tease her about her accent. I love these cards and their counter stamps; it was worth choosing the theme just to see them! Beatrix Potter as well as living at Hill Top at Far Sawrey owned many other properties in the area which she rented out, including the post office. Despite this being the nearest place to me I have no idea if it is still there as it is a nightmare trying to park in such a small place which is a popular place for visitors to the area. Surprisingly a lot of the small sub post offices survive in the Lake District possibly thanks to all those tourists and usually operate as a general store and post office. I'm glad you like them! Tourists can make a place almost hellish for the locals.